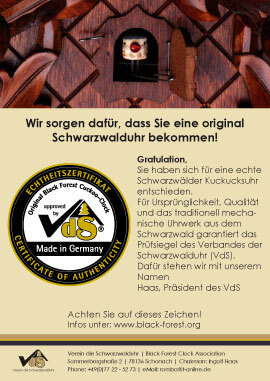 Certificate // It is your right to receive a genuine Black Forest Clock! Particularly the Black Forest Clocks from the Triberg area shall be more strongly promoted in the future thereby emphazising its unmistakable authenticity. For this reason the former “Promoting Society” (Förder-Verein) has taken a new name and nows works under “Association of the Black Forest Clock” (Verein – die Schwarzwalduhr ‘VdS’). This newly formed association has now taken on a new task. The members of the board have been concerned about the authenticity of the product for a long time, a product which represents the Black Forest in a most important way. As a consequence it was decided to introduce a Certificate of Authenticity. This decision brought to an end a long lasting process of forming an opinion among the members and it also meant that a long nourished wish of Ingolf Haas became true. “We have to give our collectors and customers the guaranty that the clock they bought definitely comes from this area.” With these words he phrases one of the essential characteristics guaranteed by this certificate. Black Forest Clocks allowed to carry this certificate actually have to keep up a high standard. One condition for example is that the clock has been made exclusively in the Black Forest. But the proof of origin alone does not suffice to be accepted for the certificate. The clock must also be working purely mechanically and all its essential parts have to be produced in the Black Forest, too. There is no chance to receive the well desired certificate for quartz clocks or for clocks running by solar energy. Chairman Ingolf Haas,”Our customers expect mechanically working clocks and that is what makes them stand out.” Clock-makers from the Triberg and Titisee-Neustadt area who reach this quality standard can purchase the certificate and add it to their products. By the way – the certificate was designed by artist Benno Gasche from Schonach. To show its internationality it is bilingual in German and English.